Today, you received an email from us about the dangers facing Israel right now and ways in which you can help ensure American support for Israel at a difficult and dangerous time. We included information about the horrific bombing in Jerusalem. In hindsight, it was wrong of us to mention this terrible tragedy the same day it occurred in the context of this email. We are deeply sorry. We express our sympathies to all those impacted by today’s events and extend our heartfelt apologies to you. Still, I suppose that this message at least shows there is some shred of decency, if not in AIPAC itself, at least among their supporters. No doubt such would not have been on display if the victims were not Jews, but one can hardly wish for the moon here. 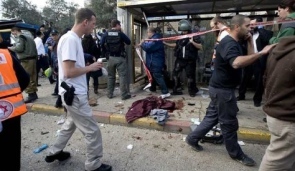 One woman was killed and at least 30 injured in a bomb blast today near the central bus station in Jerusalem. But by now all of you know that. But while I was still gathering data and reports of the incident, I received an e-mail. This message must have been composed very fast, in a hurry one can only imagine was akin to the excitement of a hungry dog that catches a glimpse of some tasty food. It’s a conversation one would think would befit a meeting of some Jew-hating white supremacist group. Instead, this rush to cash in on harm to Jews fits only too well in an organization that has mobilized huge amounts of money and people power over many years in their effort to support suicidal Israel policies which have brought nothing but harm not only to Israel but to the United States as well. Over at Think Progress, Matt Duss showed himself to be equally speedy, but a lot more humane, in his response to the same AIPAC e-mail. His analysis is quite thorough, so I’ll hope you go ahead and read it. I’ll just say this: AIPAC, more than any other single anti-Israel organization (and yes, anti-Israel is just what they are, though they are certainly more passionate about the harm they do to Palestinians), has created the atmosphere around this issue that so many identify as McCarthyist. AIPAC, you’ve done enough. Have you no sense of decency at long last? Have you left no sense of decency?